UNM Anderson hosts the Boerigter Business Breakfast Program to present relevant topics of interest to Anderson's community of friends. The UNM Anderson Boerigter Business Breakfast Program is sponsored by the Anderson School and the generosity of George and Sibilla Boerigter and SoundOff Signal. The series hosts business leaders from across the country to speak on topics of current interest. The series is offered at no cost to the business community. (Albuquerque, NM) The Anderson School of Management is pleased to present Mayor Tim Keller as the speaker for the Boerigter Business Breakfast program on Tuesday, February 6, 2018 at Hotel Albuquerque. Mayor Keller will discuss economic development initiatives and other opportunities and challenges facing the City as he begins his administration. Dean Craig White says hearing from Tim Keller as he begins his first term as mayor is important to the business community. "The state of the City in crucial areas such as economic policy, public safety, and education is critical to the ongoing success of the Albuquerque business community," says Dean White. "We wish Mayor Keller the best as he begins his administration and look forward to learning more about his plans and potential ways in which the Anderson School can assist in moving the City forward." Tim Keller became Albuquerque's Mayor on Dec. 1, 2017. As mayor, Keller is committed to prioritizing job creation, igniting innovation, and fostering broad-based economic growth. 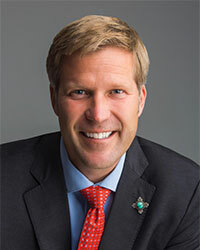 Mayor Keller previously was elected twice as State Senator for Albuquerque's International District. In the New Mexico Senate, he rose to the position of majority whip and successfully sponsored laws on wage retaliation prevention, immigrant protection, community schools, tax incentive reform, and an in-state business preference to create local jobs. He also had the distinction of cosponsoring the largest number of bipartisan bills passed during his legislative tenure. He was elected State Auditor in 2014. Mayor Keller was born and raised in Albuquerque. He graduated from St. Pius X High School, attended the University of Notre Dame where he studied Finance and Art History, and earned his MBA with honors from the Harvard Business School. Mayor Keller's presentation is free and open to the public however, reservations are required. RSVPs can be made online at http://bit.ly/MayorTimKeller or by calling Megan Borders at 505.277.1504. Space is limited and a capacity crowd is expected. The Boerigter Business Breakfast Program is made possible by the UNM Anderson School and through the generosity of George and Sibilla Boerigter and SoundOff Signal.